The fish owned by Karin Elia is displayed at The Wilson Boat House, located at 57 Harbor Street in Wilson, New York. The theme of the fish revolves around using copper pennies to mimic scales, and was created by Wilson alumni Lisa Kurilovitch. Timothy Wilson purchased an operational boathouse on the harbor front in Wilson around 1919 from Sunset Island resident Jake Miller. Three of Timothy’s sons, Floyd, Walter and Emerson later continued the family business and began transporting visitors across the harbor to the island, using their “Docksetter” ferry service. The Wilson brothers also spent over sixty years in the commercial fishing industry. The Boat House has been remodeled several times over the years, and in 2000, the restaurant underwent a complete renovation which included the construction of Linnea’s Pool, and the addition of several gift shops and updates made to Clark’s Marina. The Wilson Boat House Restaurant is the perfect place for casual dining overlooking the beautiful Wilson Harbor. After dinner, make a point of visiting the many shops that are located around the harbor, or enjoy the famous Wilson sunset and watch the sailboats glide by. The waterfront gets jumping at night with live music on the outside patio bar four nights a week. The Wilson Boat House is now open. Reservations are available by phone at 716-751-6060 or by email: michelle@wilsonboathouse.com. The menu is available online. 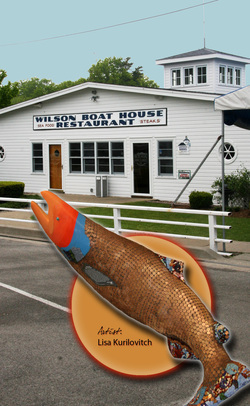 For more information about the Wilson Boat House, please visit: www.wilsonboathouse.com.